My first journey into your writing was through The Willies, but your latest novel Finitude deals with the equally world-changing subject of extreme climate change. Your subject matter seems to centre on the very real and very present problems that are haunting the human race. Where do your stories start? Do you begin with the huge looming problems and work down, or are the stories initially singularly individual problems that get bigger? You nailed it there: The stories so far have all started with me noticing something off-kilter in the world and then – well, in psychology they call it “horribleising”, blowing a problem up to its weirdest and worst possibilities. Mothers all seem to come with this capacity installed as part of their basic programming. And some of us call it “writing fiction”. It started with the first book, whose subject was Y2K. I just started writing, not sure what I was up to, but feeling compelled to ask myself what I thought about technology and other systems – like money – coming to play such a central role in our lives without us really getting a chance to decide whether this was really a good idea. So when a topic presents itself, I start doing research, taking reams of notes, and looking for the threads that start to present themselves and weave together – themes, scenes, and dramatic turning points. Ultimately, it has to stop being about ideas or making a statement and focus on a character or set of characters who have a stake in how this issue turns out. But, yeah, I keep tackling these enormous issues! So far it’s been money and technology, cloning and medical ethics, urban development, and climate change. Geez Louise, could I make it any harder on myself to tell one coherent story? I swear that one day I’ll write a book in which the fate of the world is not at stake in the third act! All of your novels have been completely self-published. What prompted the decision to go down that route? Creative necessity, really. I submitted the first three books to traditional publishers, and, aside from the out-of-hand rejections, each of the stories received interest – up to a point. Several of the publishers went through business changes, getting bought out, shutting down their fiction imprint, or simply deciding that they couldn’t take a risk on any book that didn’t come with some sort of guarantee that it would sell. Some loved it for Reason A but turned it down for Reason B, while another loved it precisely for Reason B but shied away because of Reason A! About this time I was visiting my editor in Canada. (I make my living as a copywriter.) One day we were working together at her house and she had to take a telephone call, so I was poking through her bookshelf. (Hey, at least it wasn’t the medicine cabinet.) One of the titles there caught my eye: Making Books by Hand. I flipped through it, then bought my own copy as soon as I got the chance. It sounds stupid, but for a while I made blank notebooks and journals for myself and as gifts before it occurred to me that this would work for my novels, too. But not sewn, signature-bound books; I had to learn to make paperbacks. And I discovered that, hey, a body can do that from home pretty easily, too. Are there any particular benefits or hindrances that you have found in your independent style of publishing? The benefits are life-changing. I’m an author in my eyes and other people’s, too, because I have four different books I can hold up as evidence. Whatever happens to the publishing industry is none of my concern. E-books? Sure, I can make those. Mass-market? Should it come up, I’ve learned enough about the print process to work with a large-scale print production company. Most importantly, I have a healthy relationship with my life as an artist. It’s my life and growth and interests I’m pursuing, not seeking discovery or salvation from somebody else. Of course, I have to be honest and say that, unless you’re an excellent self-promoter or happen to be chanced upon by the zeitgeist, going the indie route effectively means that you also throw out any notions of becoming rich and famous. The few that happens to are stories precisely because that’s not how it usually turns out. Besides, I’ve met rich and famous people through my work and my friendships, and they still have all their own stuff to deal with. Life is not something that’s happening over there, just beyond the next achievement. It’s right here. Sorry for spinning off on a philosophical tangent. I just find it sad to see so many people make themselves miserable and do a discredit to their heart’s work by hitching their happiness to others’ approval. As someone once put it, there are no “Big People.” Everyone’s human-sized. Could you take us through the process of creating your books? Have you got a year? Seriously, though, I’ve developed an approach to this, which contains three steps: idea-to-novel, novel-to-book, and book-to-reader. The first process involves collecting ideas, sifting through them, making a plan, and doing the writing until I’ve got a finished manuscript. In the second, I design the layout of the book, register the ISBN and all that, then print and bind it. And in the final step, I put it out into the world so that readers can buy it and try to make them aware of it. I wish I was better at this phase, but from what I’ve heard, even if I had a traditional publisher that would still be my job. So I’m learning. Over the past year or so I’ve created a podcast in which I go through each of these steps and show exactly how I do it, which other authors can then do themselves or adapt to their situation. It’s been a labour of love – a lot of work, but I feel like if there’s a world I’d like to see happen, one in which each person has the opportunity to be their own “Culture of One”, then I have a certain responsibility to share what I’ve learned and help speed others through the process. What is the next step? Could you give us a hint as to what your next book might be about? Book Five is all researched and loosely outlined, but I’m taking this one slowly. Since I’m not answerable to anyone else, I really want to produce exactly the work that calls to me most – and I’m still trying to get clear about what that is. Meanwhile, I’m drawing and painting, making books and taking them to shows, doing interviews for the podcast, and generally getting on with the other parts of my creative life. I miss working on a book, but I’m happily married now, so it’s taking some adjustment to figure out how to reconcile the contentment and activity of my domestic life with the creative impulse – now that I haven’t got angst to be my muse! I don’t really subscribe to the “tortured artist” myth, though; the work is the work, and everything else is just personal junk we bring to it. In direct answer to your question, the next book is set in Canada in the 1960s – a time of great national pride for Canadians, but there was also some pretty ugly stuff going on. Unlike the McCarthy trials, though, this was all taking place in secret. So this book’s a little different to the others – which is as it should be. To find out more about Hamish MacDonald and his writing jump over to his website. He also has a fantastically informative blog exploring everything about the DIY book world. Have a look at that here. 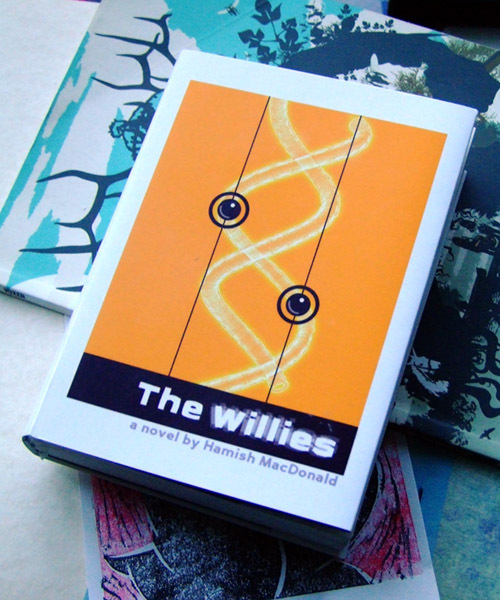 This entry was posted in DIY, Fiction, Interview, Prose, Review and tagged book, DIY, fiction, Hamish MacDonald, interview, publishing, review, story, the willies. Bookmark the permalink. What a great interview with Hamish! He’s such an inspiration, and i think that more people should know about him and his work!